Where is Charlie Gasparino when you need him? That joke will only resonate with those who were around in January-March 2008ish and were subjected to the nearly daily market rally at 3:45 PM when Charlie would show up on CNBC blurbing about a government rescue for Ambac or MBIA (MBI). [Apr 23, 2008: Ambak & MBIA Back to Their Old Ways] Ah the good ole days when our biggest worries were these relatively meaningless companies. Much like the Greece bailout, it is amazing how the market can rally on the same rumor week after week. The mortgage insurance stocks – after being left for dead Fannie, Freddie style are surging the past few days as principal reduction plans supposedly lift their prospects. The move in Ambac (ABK) is especially awesome because despite a (Wall Street) “reported profit”, apparently in its 10Q it says it could be insolvent within a year. 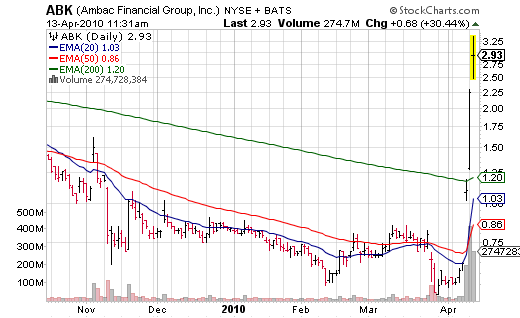 Ambac Financial Group Inc., the bond insurer that stopped paying some claims and accepting new business, jumped 71 percent in New York trading after reporting fourth-quarter net income of $558.1 million amid a tax benefit and unrealized gains on derivatives. Since no one in the equity market bothers to read anything but a headline anymore (since by doing so it would take more than 2 seconds – and HAL9000 will already have made 8000 trades in that time) in the dumbed down market, bankruptcy potential is just a meaningless detail. Further, since there is no risk in the stock market anymore and no public company can fail… people are brushing off such warnings and piling in. There used to be something we called the Greenspan put… i.e. the Maestro would find a way to make sure things never got out of hand so buy stocks at will. We need a name for Bernanke – because he makes that put look like child’s play. Maybe the Bernanke Forcefield – everything is protected, we are immune and shielded. In the old days, this sort of speculation would mark a top in my eyes… in these new days, its just another day at the office. Enjoy.